The church in action across Norwich and Norfolk was on display at the Celebrate Norwich & Norfolk festival at the Forum in Norwich on Saturday (June 16). A full day of activities highlighted much of the wide range of work undertaken by the city and county’s Christian community 365 days a year. 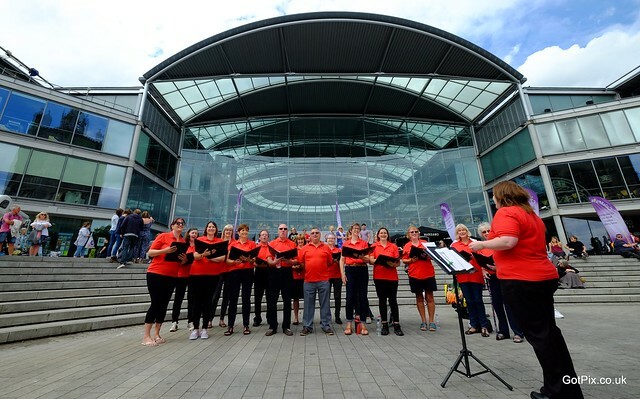 Hundreds of visitors were attracted to the event and enjoyed music and singing from a range of groups and choirs, hosted by the Norwich YFC Tracks mobile music studio. They could also enjoy the all-day Christian Social Action and Services Exhibition in The Forum and on Millennium Plain. Exhibitors included Christian Aid, YMCA Norfolk, Mothers’ Union, Horstead Centre, Community Action Norwich, Healing Rooms Norwich and Norfolk, OMF, Hebron Trust, Norfolk Postal Bible School, Samaritan’s Purse, Friends International, Christian Vision for Men, The Mix, Heartbeat Ministries, Good News, Rafiki Creative Ministries, Third Order of Franciscans, the London School of Theology and Norwich Quakers. Another popular attraction was the Key to Life interactive mobile education unit which gave free presentations on the life of Jesus. An official opening was attended by the new Lord Mayor of Norwich, Cllr Martin Schmierer, and heard an opening address by Celebrate project director John Betts with music from the London School of Theology. At the end of the day John said: “I am very pleased with how it went. It was a glorious day, with lots of enthusiastic participation and a lots of stands saying they have had lots of conversations and good contacts and are very appreciative of the whole event. Executive Director of HOPE, Roy Crowne, held a Christian leadership masterclass for over 30 people as part of Celebrate and then had a series of one-to-one sessions with organisation leaders.